I am CHOONG CHEE SAN, 48 years old. I was diagnosed with nasopharyngeal cancer in 2010. When taking the first nasopharyngeal cancer treatment, chemotherapy and radiotherapy made me suffered but I had to survive for my sons. In 2013, I felt painful in my neck bone but I didn’t take the related inspection until I can not tolerate the pain. The doctor told me that my cancer relapsed with the metastasis to the brain. In my first anticancer treatment, I totally received 6 sessions of chemotherapy and 35 sessions of radiotherapy. In cancer recurrence stage, I continuously underwent 9 sessions of chemotherapy and 25 sessions of radiotherapy. However, my tumor was not shrunk and my condition was not improved. Days by days, my physical fitness went bad to worse. Worse, the local doctor told me that it was a slim chance for me to improve my condition and what I can do was to take chemotherapy to control the cancer. On the edge of depression, accidentally I read a piece of news about the cancer symposium, which would be held by Modern Cancer Hospital Guangzhou in Ipoh. With a gleam of hope I participated in this symposium. At there, I had a better understanding of advanced cancer technology in China, such as interventional therapy, cryotherapy, natural therapy, etc. while in Malaysia cancer can be treated only three traditional therapies, operation, chemotherapy and radiotherapy. I informed my condition with medical report to the vice president of Modern Cancer Hospital Guangzhou, Chen Bing, who suggested me undergoing interventional therapy and natural therapy. If I kept on cancer treatment in Malaysia, my improvement may not have any improvement. When cancer deteriorated, the doctor would only conduct chemotherapy. In Modern Cancer Hospital Guangzhou more advanced technology can be provided to me, so I would like to try in Guangzhou instead of waiting to death in Malaysia. Since then, my anticancer trip began. 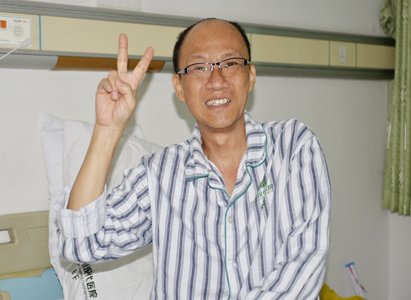 On April 25th 2015, I hospitalized in Modern Cancer Hospital Guangzhou with the company of my wife. I took the related inspections and then the MDT (Multidisplinary Team) studied and discussed my case. After one week, I received the first session of interventional therapy. In my therapeutic process, I had not felt so much pain. The symptoms of stuffy ears and eyes with double images were alleviated and I did not have any side effects. 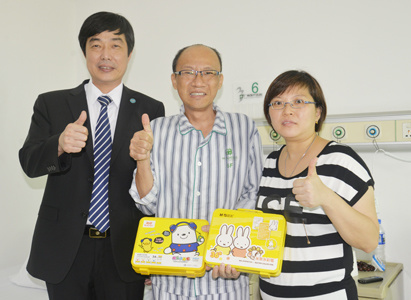 In Malaysia, only one oncologist followed my case while in Modern Cancer Hospital Guangzhou, a medial team helped me. When the report was done, the doctor discussed my condition so that they could decide the next cancer treatment which made me feel safer and more reliable. In order to reinforce the immunity function, doctor conducted natural therapy for me. After taking multidisplinary comprehensive cancer treatment, my tumor was shrunk. Now I am in a good mental status; my appetite and sleeping are good. Sincerely thank you for all the warm-hearted people who have helped me. I can not do anything in return but to get better efficacy. It was the warm-hearted people that helped me so that I can go on my cancer treatment and prolong my lifetime with the company with my wife and sons. What’s more, I expressed gratitude to my families for their company. I will bravely fight against with nasopharyngeal cancer for my wife and sons.